This week marks the 140th anniversary of the laying of the cornerstone of the Cathedral of the Incarnation. Alexander T. Stewart, “merchant prince” and founder of Garden City, passed away on April 10, 1876. Shortly thereafter his widow Cornelia planned the building of a cathedral as a memorial and mausoleum for her late husband. The idea came on suddenly and strongly, and she set about making plans immediately. Ground was broken on the project just four months after A.T. Stewart&apos;s death. 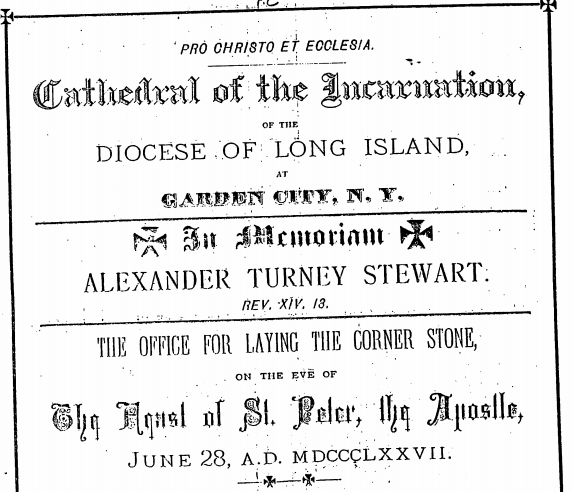 Less than a year later, on June 28, 1877, the first cornerstone was laid at the Cathedral of the Incarnation. 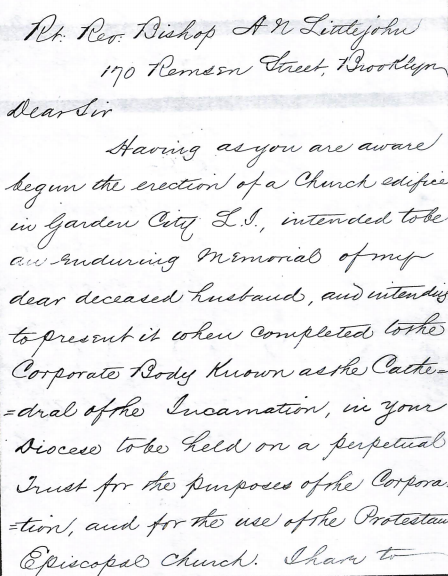 Cornelia Stewart sent a letter to the Right Reverend Abram N. Littlejohn, first Bishop of the Episcopal Diocese of Long Island, requesting his presence at the ceremony. "The Cathedral Edifice, according to all Christian usage and tradition, is but the foundation on which we are to build--the Centre around which affiliated institutions are to be grouped as the years roll on--the sacred place within which a doctrine is to be preached and a life exhibited which shall issue in works of love and mercy to be done in Christ&apos;s name, and in forms as various as are the wants and woes of our redeemed humanity." The Hon. L. Bradford Prince, a Trustee of the cathedral, told the New York Times in 1877 that “the erection and endowment of this cathedral constitutes the most important event in the history of the Episcopal Church since the arrival of the first Bishop, nearly a century ago." Not everyone shared Judge Prince’s enthusiasm, however. To many, Garden City seemed a strange location for a cathedral. At the time, Nassau County did not exist. Garden City was a distant part of Queens County, with few residents. 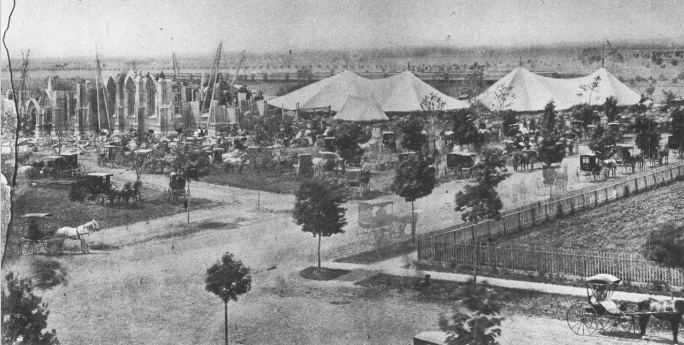 Though trees were planted before the ceremony, they were only saplings, and large tents and awnings needed to be erected to shade the procession. Despite their doubts, some ten thousand people arrived in railroad cars and carriages for the cornerstone laying ceremony on June 28th. 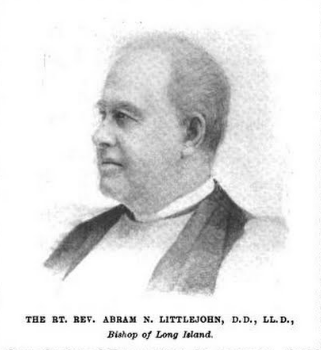 Bishop Littlejohn gave a short address, then set a copper box filled with religious items, newspapers, engravings and coins into the hollow of the cornerstone, then struck the stone three times with a trowel and hammer. Following the ceremony, lunch was served for 5,000. A choir of 200 people, comprised of various churches from the Diocese, opened the day with the hymn "The Church&apos;s One Foundation," a hymn which echoed the sentiments in Bishop&apos;s Littlejohn&apos;s letter to Cornelia Stewart. In this video, our music director Larry Tremsky plays a few bars from the hymn, using one of the organ&apos;s original stops. This week we celebrate not only the beginnings of a historic building, but most importantly the start of a ministry of faith, hope and love in Garden City and across Long Island.